Balfour (the official SHSU ring provider) will be on campus to take orders for SHSU class rings. Students with 75 or more hours towards their degree are eligible to order a class ring. Students unable to attend one of the ring day events may order their ring online at balfour.com. 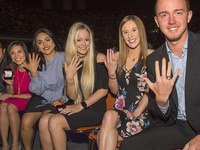 Rings must be ordered by September 14 to be ensure it spends the night in the home of Sam Houston prior to the ring ceremony to be held on November 13.